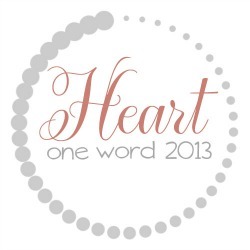 My one word for 2013 is heart. I want a heart that mirrors God. When people look at me, what do they see? Do they see Jesus? If we claim to be a Christian, we need to act like it. Our heart needs to look like Jesus. Our actions need to be Christ-like. Our words need to be uplifting. Right now my focus is my words. Are my words lifting others up? Do they encourage others? Do they bring life, love and laughter? Do the challenge others to see Jesus. Or are my words hurting others? Do they bring pain? Do they cut deep? I want my words to bring life. I want them to bring truth. I want my words to point others to Jesus. If my words do not bring life and truth, do I really need to speak them? Just as the song says, words can start a fire in our hearts, or they can put one out. My words are not always uplifting. Especially at home. I get tired. I get sick of chasing runaway dogs. I get sick of attitudes. I get moody. My family deserves my words to be life. They need my words to be life. I will continue working on my words. Continue to strive to have a heart like Jesus, and for my words to reflect that. Do you struggle in this area? Is it hard for your words to be uplifting? What is your one word for 2013? Are you still working on it? This mirrors my thoughts exactly! Word for word.. As if I wrote it myself! I am working on my words at well, especially at home. My One Word is "simply". I recently wrote a post about my thoughts on "simply loving".